If you want something completely charming and unique, this two-tone 14K gold owl pendant from Apples of Gold Jewelry is the perfect idea! 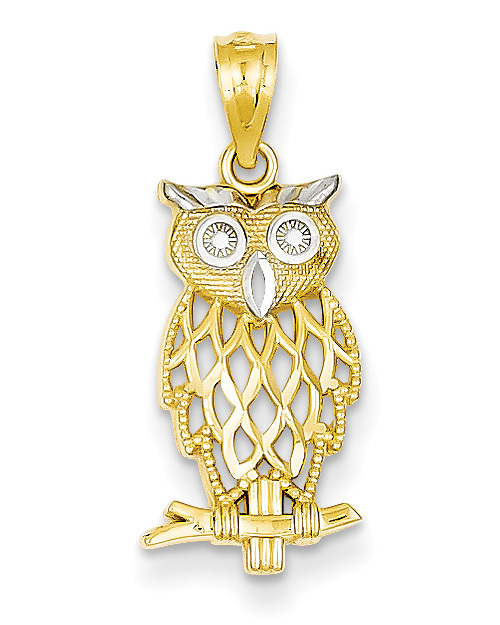 The pendant is made from 14K yellow gold, and has white rhodium making up the eyes, beak, and top feathers of the owl. The owl is delicately designed and detailed, with cut-out feathers, and is perched on a small tree branch. The pendant measures 15/16" tall by 3/8" in width, and is made in the U.S.A. This white rhodium on the owl really contrasts against the 14K yellow gold, making the accents stand out. Pair this pendant with your favorite chain to make a truly special piece. We guarantee our Two-Tone 14K Gold Owl Pendant to be high quality, authentic jewelry, as described above.